I just found out that Noomi Rapace, who played Lisbeth Salander (the girl with the dragon tattoo) in the Swedish version of the movie, may be nominated for an Oscar for her role. As soon as I finished reading the book, I stopped by the RedBox to grab a copy of the movie (the Swedish, subtitled version.) And although a few of the characters didn't really look as I expected that they would, including lead character Blomkvist and his business partner Erika Berger, most of the rest of them did (especially Harriet, Henrik and Martin.) But When I first saw Noomi Rapace as Lisbeth, I thought, "Wow! Perfect casting!" She looked and acted exactly like the character in the book. Exactly! So, I said all of this to say that I hope Noomi Rapace at least gets the nod. She was very good! And I hope we get to see more of her versatility in in the US. If she spoke English (and I don't know that she doesn't), she would be perfect to play the American version as well. She did all three Millenium Trilogy movies as well as the Swedish TV series called Millenium, also based on the books. By the way, If you haven't read the book, read it. It's slow to start but once it gets going, it's a really good story. It's definitely worth all the hype. The Help is the story of a reluctant "hero" nicknamed Skeeter - a young, affluent white woman growing up in Mississippi during the heart of the Civil Rights movement and the passion and commitment she had to follow her dreams in spite of all of the societal roadblocks placed genteely in her way. The story also centers around Aibileen and Minny, two black domestics, living in her city and working in her community and the stories of the families to which they, and so many other domestics, dedicate their daily lives. Ms. Stockett writes from the perspectives of all three of the main characters so, not only does the perspective change throughtout the book, so does the writing style. This story has moments that are both heartwarming and heartbreaking; humorous and horrible. It is an emotional rollercoaster through two and a half tumultuous years of "proper" southern living. I found it to be a wonderful story with lots of emotion without ever feeling sappy or corny. I could picture the houses, the farms, the women, their husbands, the children. There were times when I needed to put the book down because I was afraid of what was going to happen. There were times when I felt the tears well up because of what did. Although historical fiction doesn't usually interest me, I would highly recommend The Help. I loved this story. Once I started it, I found that I couldn't put this book down. I just had to know what was going to happen next! If you liked The Secret Life of Bees, by Sue Monk Kidd, you will love The Help by Kathryn Stockett! I got my new Nook yesterday. Finally! 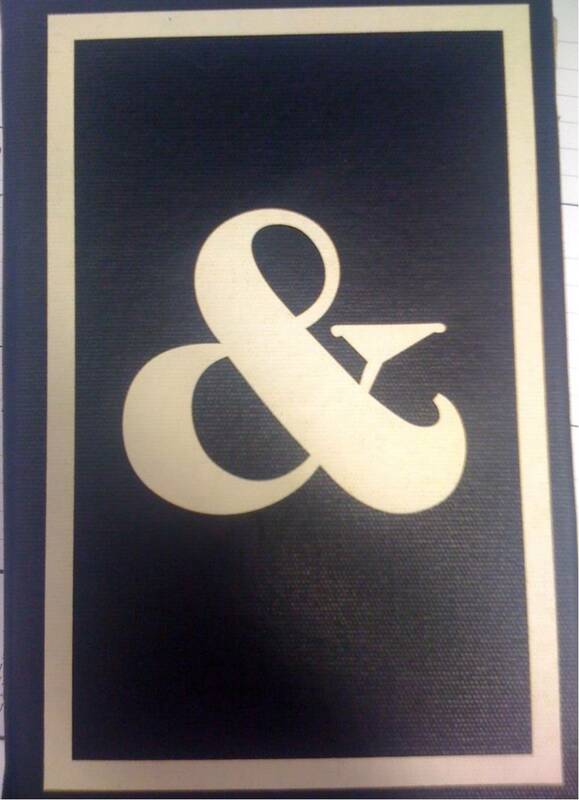 It is new and gorgeous, charged up and ready to read! The only thing is... I couldn't wait. I don't go very long without a story in-hand so I started reading The Help by Kathryn Stockett (an actual book) the day that I finished The Girl with the Dragon Tattoo. So far, so good. But in the meantime, I spent the afternoon re-loading my books including a few new ones that I got for free from the Borders ebooks launch (which I sent to my Nook using Adobe Digital Editions), and gave my Nook a new name. In the tradition of Psych's Shawn and Gus (if you are not familiar, Shawn always introduces his partner Gus with a ridiculous made-up name - our favorite by far is Ghee Buttersnaps!) my daughter Lauryn named her Nook Dr. McLee Sugarsnaps III. 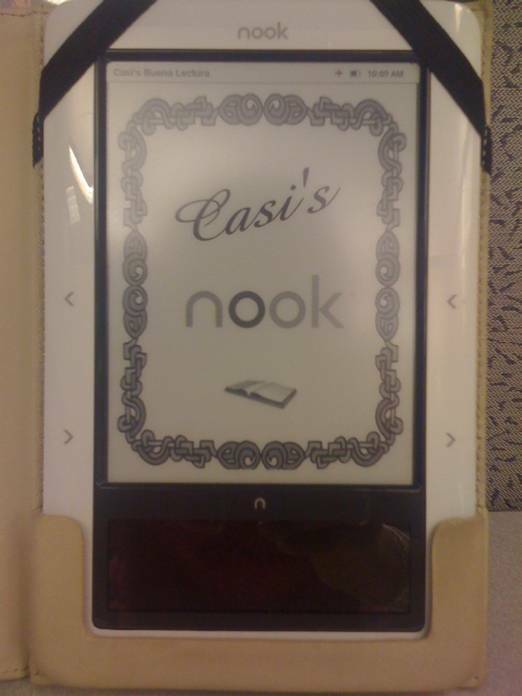 My original Nook was simply called Casi's Buena Lectura, which simply means "Good Reading" in spanish. But now that I have a new unit, a new name seemed more appropriate. Lauryn and I tossed around a few silly names and I finally settled on a silly one that I think kind of flows. So my new Nook's name is now Amelina Nookenpox. I know it's silly but it just shows how happy I am to be back in the Nook business. And just in time for Free Friday! So, I just verified that my newest (and hopefully LAST) Nook is on its way to my home. I can't wait to get it back and all set up for happy reading again. I'll update on that situation tomorrow. I want to blog today about computer security. Several times in the last few weeks I have received emails from from friends who have apparently been hacked. A few times it has happened from their personal email accounts and a few of those happened right on Facebook. I just have one question about all of this: WHAT IS GOING ON WITH THESE HACKERS????? Seriously!!! You have nothing better to do with your time than to pray on innocent strangers and send random messages to their friends and family? I can't stand this anymore! These people are so intelligent. I mean, really! Why can't they direct that intelligence to positive efforts - like cleaning up the oil spills or building a colony on Mars or verifying the string theory or something? Why spend hours at a computer sending illiterate and ridiculous requests for money to be wired to a "friend" stranded at the British Embassy or in the African jungle with no money? And it's 2010; how many people still fall for these tricks? 1. Make your passwords more complicated. I know that its our habit to use the same passwords over and over again but you need to make sure that they are not too easy to guess. Throw a capital letter, symbol and/or number in the middle of the word and you've got yourself a more secure password. 2. Change your passwords regularly. At work, I'm forced to change my passwords every 60 days. At home, with all of the accounts that I have, that feels a little ridiculous. But every once in a while, just go through your main accounts, especially your email and finance-related ones, and change the passwords. Better safe than sorry! 3. Set up your security questions and remember your answers. This is the best way for a secure site to verify who you are and the easiest way for you to be able to reset passwords painlessly. I try to never use the questions like "What is your favorite book/restaurant/song" because, quite frankly, that information can change at any moment. Try to use the questions that have stagnant answers such as your father's middle name or how many siblings you have or the month that your oldest child was born. That way, you won't have to think back to a time in your life when you really loved Pakistani food but can't remember the name of that restaurant on the corner that you used to go to when you worked for your last company. Hopefully this will help you to keep out of the way of the hackers. And hopefully, the hackers will eventually realize that they can use their considerable talents to make lots of legitimate money working for a great computer software company or NASA or NOAA rather than causing distractions and inconveniences in people's daily lives. They should be using their powers for good before they really hurt someone! So... I'm still in Nook limbo. I did receive my new Nook yesterday, as promised. I opened the boxes and threw it on the charger and then did some running around with Darryl. When I got home, I settled myself down to re-load my wallpapers, screen savers and books. When I started the system up, I noticed a few shadowy lines in the background of my screen. I ignored them, at first, and kept on with my re-registration process and adding my WiFi data which all went very smoothly. But I could still see the shadows in the background. I clicked on a book in my library and opened it up. I could still see the shadows but it wasn't so bad. I thought, "It's just my imagination. I can live with this." Let's hope the next unit is NEW and not another refurb! Then I turned a page. Not only do I still see the shadows but I have a double flash and I see rows and rows of vertical lines running through my unit. "Ugh!" I tried it again. Two flashes, lots of lines. "Huge sigh!" I called B&N again and spoke to Jerome, who was very patient with me while I explained to him that my supposedly "new" unit has double flashes, shadows and lots of lines. He walked me through the whole reset six times routine and... you guessed it... I still had lines. So, I put BOTH units in the box I just received, wrapped them up tightly and am headed to the post office this afternoon to make sure that they get back to B&N safe and sound. And my THIRD unit is on it's way. I still love the Nook. I'm not giving up! Let's just hope this one's the keeper! Everyone knows how much I love my Nook. In fact, I tout it's advantages so often that I've sold several units (commission-free by the way) since I received my own Nook back in January. But, as with all electronic devices, there is always a glitch or two along the way. On Saturday, I was happily skimming through "The Girl With The Dragon Tattoo" (see my review here) while my husband took us on a leisurely drive through Philadelphia. All seemed to be going well... the sun was shining, the car was full of gas and the kids were quietly occupied in the back seat. When lo and behold... my Nook caught a glitch. I'm still not exactly sure what happened. Suddenly, everything moved to the center of the page so I could only see the first half of my pages. "OK," I tell myself, "don't panic." So I put the Nook to sleep and then woke it up. Problem still there. Turned it off completely, waited 30 seconds, turned it back on. Not fixed. I turned it over, removed the back and the battery, waited 30 seconds, popped it all back together. Huge, sad sigh. Still not fixed. So I called B&N, eyes glassy, and explained my problem to Ryan who answered my call. Ryan was wonderful. He walked me through resetting the Nook (which consisted of holding the power button for 30 second intervals 6 times in a row) and then he unregistered me remotely. Although he tried, nothing helped. So he placed an order for a replacement Nook. It should arrive today. In the meantime, I wanted to finish my story - I was less than 100 pages from the end. So I borrowed my daughter's Nook (fortunately we share an account so she has all my book and I have all of hers) to pick up where I left off. As she handed me her device, she says, "Be careful here. It's cracked." And she points to the right page turning arrow. "No," I say, "that's just the design." "No." she replies. "Look." She touched the arrow and it is actually cracked in the frame. "I read about that issue," I told her. "It's a manufacturer's defect. Don't worry. We can get you a new one." 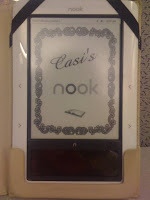 So after dinner last night, we drove to the local B&N store where we originally purchased her Nook just a couple short months ago and we were able to swap out her cracked Nook for a new one hassle-free (thanks to Nick who was so kind and patient.) Apparently the newer design is a softer plastic that doesn't crack anymore. When I got her new device home and onto the charger, I did notice that the casing was a little more pliable. I hope when my new one arrives today, it's got that same new design. We are still a Nook-loving family. And because our exchanges were both hassle-free and our Customer Service agents were both wonderfully helpful and genuinely nice people, we will remain huge fans of Barnes and Noble for a long time to come! If you're looking for me over the next couple of days, I will be sideloading ebooks, screensavers and wallpapers to a couple of new Nook devices. We are HUGE fans of So You Think You Can Dance on Fox. It's undoubtedly my favorite show. Every year we meet and feel passionate about new dancers and have watched as some of their careers have risen at meteoric rates. This year the show brought back All-Stars so we have been treated to a wonderful season of seeing some of our favs again and again. So any dance movie produced by Adam Shankman and starring the likes of Choreographer Dave Scott and dancers Twitch Boss, Joshua Allen, Musa Cooper, Legacy Perez, Ashlee Nino, and Ivan Koumaev, all of SYTYCD fame, was a must-see summer event for us. Well... If you are looking for great acting and a plausible storyline, this is certainly NOT the place where you want to spend $15 and 2 hours of your life. The acting was horrendous. The only actor that I even recognized was Disney kid Alyson Stoner, who I first recognized as a backup dancer for Missy Elliott but has made several movies, her own TV show and tons of TV commercials since then. As expected, she was terrific. Everyone else... eh! The plot was predictable and, really, I couldn't have cared less for the characters' plight. They were nice kids but I really just wanted them to get to the dancing. I have to admit that I don't know if I would have enjoyed the movie as much if we hadn't chosen to see it in 3D. The effects were magnificent (the colors, the lights, the Icees - you'll see!). The dancing was phenomenal. Everything from their rehearsals to the big battle scenes were spectacular to watch. So good, in fact, that the small audience in the theater applauded wildly after the final battle scene ended. It was that good! I wish they had shown more of Johsua Allen - he was the Season 4 winner of SYTYCD. This would have been a great place to showcase his many talents to the masses, beyond the audience of the show. So, while the acting was mediocre and the plot was contrived and corny, the dancing makes it all worthwhile! Next time they should just forget the storyline altogether and let those awesome dancers just do what they do. Dance! I just finished reading The Passage by Justin Cronin. Although it was only released in June, I anxiously downloaded this to my Nook based on recommendations from other readers. This is an author I've never heard of and a book I'd never seen advertised, but I thought I'd take a chance. Boy, did it pay off! You don't have to be a die-hard sci fi buff to enjoy this story. Although the premise is fantastic, it also has aspects of love and relationships and epic struggles for mere survival in the most unusual of circumstances. You feel what the characters feel - hungry, cold, afraid. That's what a good book is supposed to do! The Passage is the first novel that I've read in a long while that I would give 5 stars*. It was that good. I highly recommend it. When Amazon first introduced the Kindle e-reader, my mom called me and said, "I think I've found something you'll love. Take a look at the Kindle on Amazon." I looked at it. Really, it didn't catch my fancy and I'm not sure why. I called her back and told her, "I don't really think I want that." I mean, at the time, it was around $350 and for me to look at it and say, "Eh!" didn't really warrant spending that kind of money. 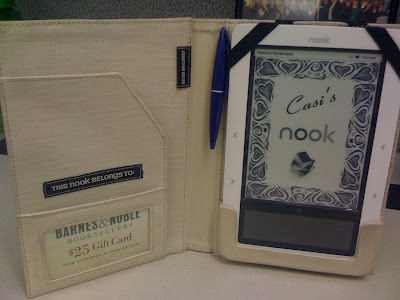 Then I saw an ad for the Nook. Immediately, the Nook grabbed me. I can't explain the pull. Maybe it was the color touch screen. Maybe it was the fact that it was linked to Barnes & Noble, my favorite bookstore. Maybe it was the fact that I can download books from my local library right to my device for free. Honestly I can't say. But from the time it was presented until it was actually for sale, I had decided that that was what I wanted. Since then, we have been inseparable. Any purse that I buy has to have enough room to carry it. I have about 75 books on there, some read, quite a few still on the waiting list, some sideloaded in pdf format. And since B&N offers new free books every Friday, my list keeps growing steadily and I am introduced to new authors that I probably never would have read otherwise. And, of course, once I learned how to create my own screensavers and wallpapers, I was completely sold! My daughter has her own Nook now, as does my mom. We're a Nook family. We have been known to spend hot Saturdays in a the confines of a cool B&N store, having lunch and taking advantage of the free coffee or dessert coupon (only presented while in the store). I know that there are still people out there that would prefer a good old, page turning paperback, and that's fine. But there are lots of advantages to the Nook, the main one being that I no longer have to find room to store all of those new books that I just can't live without reading. Oh, and no more late fees from the library. When a book is due, it's automatically "returned." The built-in hard drive holds 1500 books and the 4GB micro SD that I added means that I won't run out of room, or reading, for a long, long time. 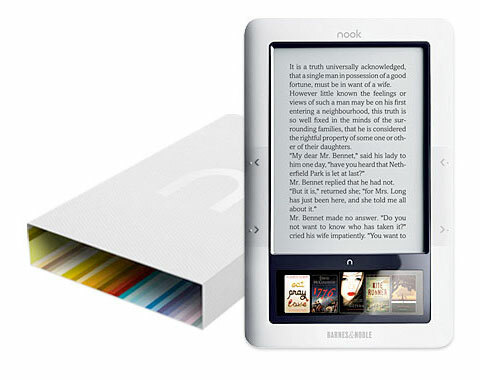 Seriously, if you're a reader and are trying to decide which e-reader to buy, I would suggest that you consider the Nook. If you have any questions about it before you decide, feel free to drop me a line. Or check out Unbound, B&N's Nook blog and hear from other happy Nook readers.